UPPER WEST SIDE — Rats plague everything from restaurants and playgrounds to apartment buildings and mom-and-pop shops. In some neighborhoods, residents and leaders say infestations have reached a breaking point, with rats roaming nightly. 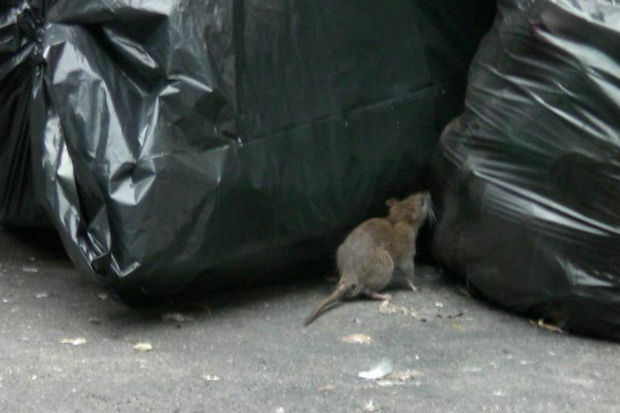 At a recent meeting on the Upper West Side, City Councilman Mark Levine characterized the neighborhood's rat problem as "an epidemic." "It affects our health, our safety and we must tackle it," he said. 1. Organize Your Block and Get the Attention of the "Rat Czar"
Melissa Elstein decided she wouldn't let her block get overrun by rats anymore. "I realized that we had rats in the tree wells, the alleys… the cars, the planters… dead rats, live rats, rat feces," she recounted of her block in Manhattan's West 80s. Elstein went door to door and got her neighbors signed up and committed to combating the infestation and attend a meeting on the problem. "We didn’t know how many people were going to show up," she recalled. "There was a huge crowd." In May, with a critical mass enlisted, Elstein contacted Caroline Bragdon, a research scientist from the city's Department of Health, known affectionately as the "rat czar." Bragdon agreed to come do a walk-through along with neighbors, pointing out where she saw rat nests and possible food sources. Part of her expertise is in confirming a rat problem exists including noting gnaw marks, greasy track marks from where they slink along walls and burrow holes. Bragdon will also point out where improper garbage storage is happening — rats will eat dinner scraps and only need an ounce of food and water a day to survive — as well as any other potential human food access points. She'll also share how to block rats' entryways and destroy their nests and burrows. According to Bragdon, "rats need to live 100 to 400 feet from their food source," so both the nests and the food source have to be eliminated. Bragdon returned for a follow-up to see whether issues were handled and now returns on a monthly basis, Elstein said. "We’ve already seen huge improvements," Elstein said. It's this kind of dogged attention that gets results, said Manhattan Borough President Gale Brewer. "You actually just have to find a block association and go door to door," she said. "There’s no other way to do it." The city hosts half-day trainings that cover all the basics and best practices of pest management — and they're free. Hosted by the Department of Health, the trainings are geared towards teaching homeowners, building staff and residents how to combat rat infestations using a variety of strategies. Plus, participants get a free rat-resistant trash can. If you and your neighbors want to attend, just gather a minimum of 20 people and ask the DOH to host one for you. Or, you can join an academy that's already scheduled. Those interested in a deeper dive into rat management can attend a free three-day course, complete with homework and field trips, also free and sponsored by the city. To sign up for either option, send an email to ratportal@health.nyc.gov or call 311. If you can't get your super to the academy, you can contact the Department of Health and ask them to send you free pamphlets that cover best practices for rat eradication. Getting rid of rats involves much more than one might assume, and education is an important first step, experts said. ► Rats can survive on food grease alone, so clean up grease with a bleach-and-water solution. ► Rats can get inside a space the size of a quarter, so sealing up holes outside the property is essential. ► Ivy and overgrown brush create ideal conditions for rats to dig under them and create burrows in the ground. For more information or to get the official city pamphlet, go here. If you can't get your building to use metal trash cans with tight-fitting lids or to at least put garbage out closer to the actual pickup time, removing the organic waste — such as uneaten meat, stale bread, coffee grounds, banana peels or any leftover food — is a good solution, Bragdon said. Within the past 12 months, the Department of Sanitation launched a pilot program for organics collection in The Bronx, Brooklyn, Queens and Staten Island. In addition, public schools and nonprofit organizations in Manhattan, Brooklyn, Staten Island and Queens have participated. Participants separate organic waste and put it in sealed plastic bins for separate pickup by the Department of Sanitation. Suddenly, hungry rats are robbed of their usual food source. "It really is a solution," Bragdon said. Check whether your building is within a pilot area here or is near a school. And as of this fall, all schools will participate in the organics collection program, meaning buildings close to schools could be added to the route. Go here and click on “inquiry form" to get the process started. The department will next meet with the building and work through setting up a plan before adding a start date. "To date, we have had the best success in buildings where there is an enthusiastic 'champion' (could be a resident, a board member, a super), and cooperative building management that ensures the support of building staff," Department of Sanitation spokesman Keith Mellis wrote in an email. Any garbage bag that says it's "rat proof" is bogus and will only slow down your efforts, Bragdon said. Additionally, fumigation is a technique the Department of Health frowns upon because of its adverse effects on humans. Plus, it won't solve the root of the problem, which is getting rid of the food source drawing rats in the first place. You can use the map below to locate the worst rat infestations in the city. To see what action the DOH has taken regarding a rat complaint, click here to search by block. The "rat portal" can help guide whether a new 311 complaint needs to be made, Bragdon said. "The inspection is only as good as the inspector on that day and time," she explained. "If you feel we’re really missing the boat, which sometimes we do, let your community board and elected officials know."